Louis Tomlinson, footballer and member of the band One Direction, and John Ryan, businessman and previous Chairman of Doncaster Rovers, are launching a crowdfunding campaign with Crowdfunder to support Doncaster Rovers football club. The campaign was launched in London on 19th June 2014 by Tomlinson. Louis will ask fans and football supporters to join him making pledges of cash to reach their funding target of £2million and support his ambitions for Doncaster Rovers. The campaign is thought to be one of the biggest UK crowdfunding campaigns ever. The Tomlinson Ryan Trust has already agreed to put in a six-figure sum as part of the crowdfund campaign to show its commitment and to encourage fans to come on the journey with them. Tomlinson, who plays for the Doncaster Rovers Reserves, recently set up the trust with businessman and ex-Doncaster Rovers Chairman, John Ryan. The Trust aims to support and develop Doncaster Rovers Football Club. It has been setup for the benefit of club and with the aspirations of its supporters in mind. Its core purpose is to guarantee a successful financial future for the club and allowing fans to have a say and play a greater part in the running of the club. The Trust aims to support the club’s ambitions on the football field, to develop its schools, youth and charity programmes and to grow the club as a brand, as well as its supporter base, both locally and internationally. In return for pledges of cash, the Trust will offer a selection of exciting and exclusive rewards from £5 upwards. Supporters can be a part of a new ‘Club 28’ with different levels of membership giving them the chance to have a say in the future of Doncaster Rovers. There will also be an exciting range of new ‘Club 28’ merchandise on offer created specially for the crowdfunding campaign, including armbands and t-shirts, and only available through Crowdfunder. These rewards will only be released if the campaign hits its overall funding target. If the target is not reached, no money will be taken and the rewards will not be given out. “For me, this is all about the football, the community and restoring the excitement and desire to making Doncaster Rovers the most exciting club to play for in Yorkshire. I want to see the Doncaster Rovers supporters get the club the success it deserves. I grew up in Doncaster and have felt the love for football run through the town, it’s for that reason that I have a real personal passion to make Doncaster Rovers a success story. This is a big step which I believe will open up opportunities to provide a very, very exciting future for the club and its supporters,’ said Louis Tomlinson. “By setting up the Trust, launching the crowdfunding campaign with crowdfunder.co.uk, and putting our own money in, we are making it clear to Doncaster Rovers supporters, and the general public, that we are planning to give the club the support and resources it needs. As its previous Chairman I am still totally committed to developing an exciting future for the club. The objectives of the trust provide a roadmap to make the club an even greater success. I am very pleased to join forces with Louis to make this happen. 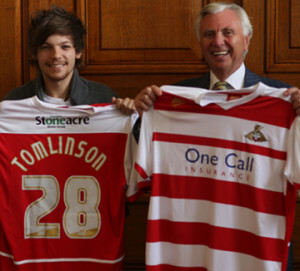 It’s an exciting moment for Doncaster Rovers,” said John Ryan.